Discover why CERN, Ford, GE, Hitachi, Lockheed Martin, NASA, Raytheon, TESLA, TE Connectivity and thousands more discerning organizations rely on our testers. Explore solutions for countless applications in Transportation, Aerospace, Energy, Medical Devices, Defense, Scientific R&D, and more. 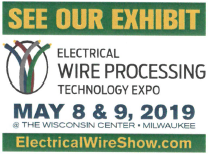 Come early to the 2019 Wire Processing Expo to attend our pre-show seminars on May 7, then join us at our booth May 8-9 as we provide hands-on demonstrations of our CableEye® Cable and Wire Harness Test Systems. Visit our Smart Assembly Display: A smart connector assembly and test set-up configured with light-guided connector assembly, tower light signalling, foot-pedal remote control, touch screen PC, barcode-tracking, data-logging, labelling and report generation. By completely automating the test process after the operator attaches a cable, you eliminate any chance that testing or documentation will differ from one cable to the next. A special macro instruction allows you to create image-rich work instructions to also reduce operator mistakes during test set-up. Write the instructions in any language/s you like with any number of images you like. You have complete control of whether the work instructions completely or partially overlap the production-testing screen. Work instructions can be coupled with operator text to speech conversion to form a totally heads-down workstation. 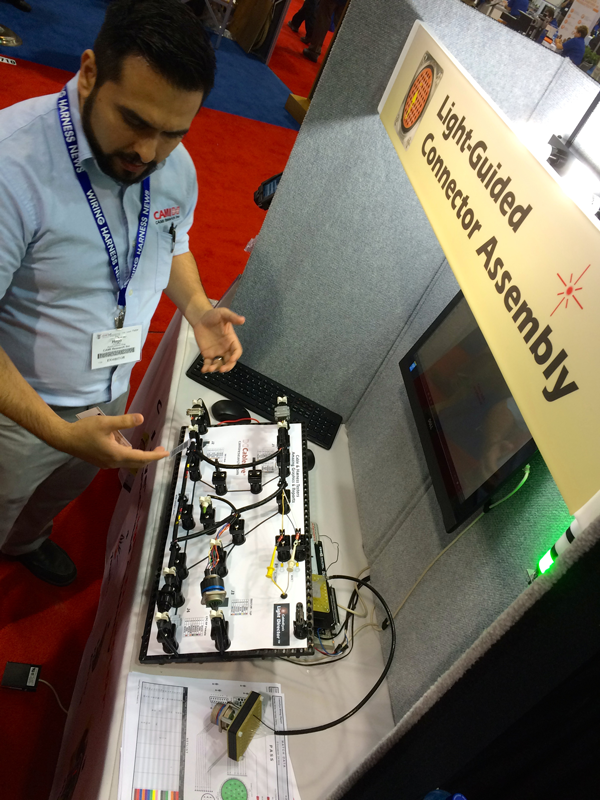 Ask us to show you how to set up your 4-wire-enabled testers with the 4-wire conversion board. 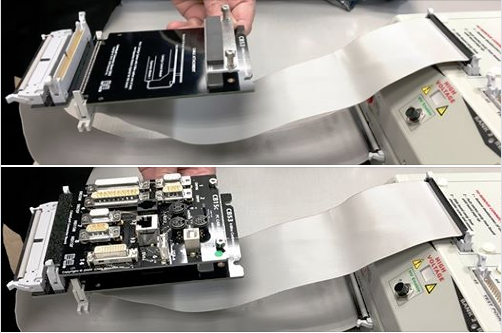 The CB53 is a special connector motherboard that will convert a top-mounted standard 64-pin connector board test fixture into a 4-wire test fixture. Conversion is valid when the UUT connects directly into the standard board rather than via a flying lead or adapter cable and eliminates the need to otherwise create custom 4-Wire test fixtures. If the cable you need to attach to the CB board cannot be directly or easily connected to the tester itself, you can float the CB53/CBx board assembly off the tester using two CB Board Extension Cables (Item 856) custom made to any length desired (see photo). Because this is a 4-wire system, the length of the extensions will not affect the measurement result. For many applications, using the CB53 is faster and much less expensive than creating a custom 4-wire fixture, and provides acceptable accuracy. 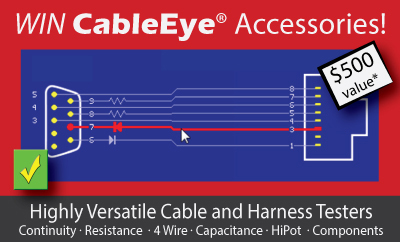 The CB53 fits all CableEye models and is rated for HiPot testing at 800 Vdc, 500 Vac. 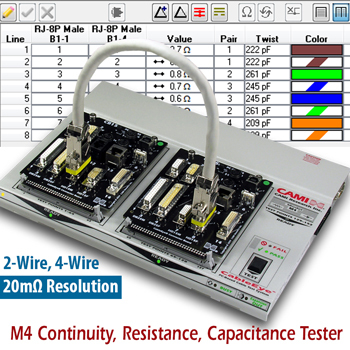 4-Wire resistance measurement is available for models M4 and HVX-series CableEye testers. Ask us to show you how to set up your testers with the 4-wire conversion board. Model M4 Low Voltage Tester with Capacitance and 4-Wire Measurement Capabilities. Come check out our latest low voltage tester, Model M4. The expandable M4 offers both 4-wire Kelvin measurement and two-wire resistance measurement as standard ... each with a resolution of 20mΩ. Ask us to show you how easy it is to determine wire length and wire twist relationships (in pairs or triplets) with this tester. Order your HVX-series HiPot tester with capacitance option to enjoy the same capabilities as the M4 during low voltage testing. Ask us to show you how to determine wire length and twist relationships. Tester and sample screenshot of netlist showing pin-to-pin wire colors, resistance, capacitance, and twist relationship. Customize the netlist to show more, or less. Simulating actual manufacturing tasks, you can build a cable, then learn and test it for yourself. At the Automation Station, discover the simplicity of programming CableEye for automation by testing the cable with a macro and experiencing various features and peripherals that might be needed in an automated test environment (e.g. pedal, barcode reader, tower light, label printer etc.). 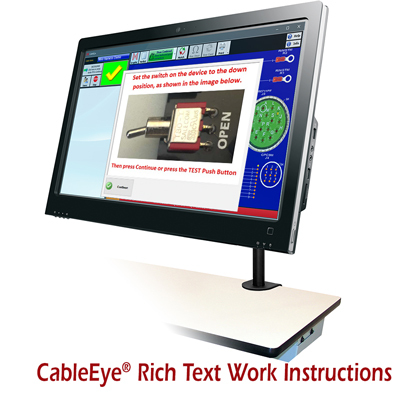 Cable Build Station - Expo Display: CableEye GUI During Cable Build, Learn, and Test. 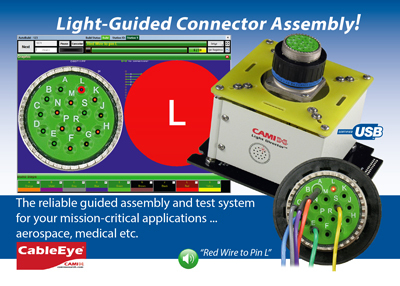 Note the color-coded graphical wiring display using connector images imported with optional CableEye software. Wired pins are highlighted, in-line components are detected, measured, and drawn schematically, and errors are identified and color-coded. A Netlist view is available with a single click. "Beyond Continuity & HiPot Measurements"
CAMI Research will hold this complimentary seminar the morning of Tuesday, May 7th at the Wisconsin Center (same location as the WPT EXPO). Space is limited, so please book early. If you're looking for the Advanced Training Workshop "Improving Reliability of Continuity & HiPot Testers", please scroll on down to the next section. You are welcome to register for both. NOTE: The exhibition hall is open to the public Wednesday and Thursday. This informative and interactive seminar is for motivated employees of any company looking to improve product quality and productivity whether their products are cable or harnesses, or products in which cables /harnesses are parts or subassemblies. 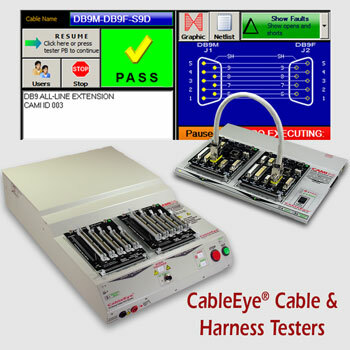 Cable and harness testing applies to countless applications in Transportation, Aerospace, Energy, Medical Devices, Defense, Scientific R&D, and more. Prior knowledge of cable testing is not required. A Certificate of Attendance will be provided to everyone who completes the class. 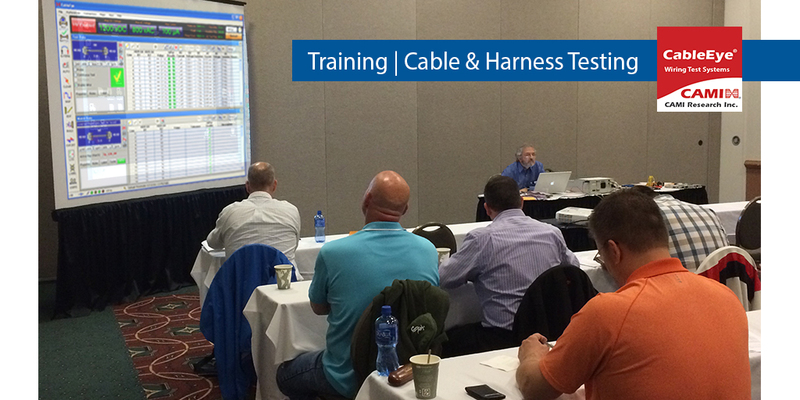 Each seminar attendee will be eligible to participate in a drawing to win $500 in CableEye accessories. See below for details. All contact fields must be completed. list any topics that you are hoping to explore. Christopher Strangio is the President and founder of CAMI Research and holds degrees in Electrical Engineering from Villanova University and MIT. 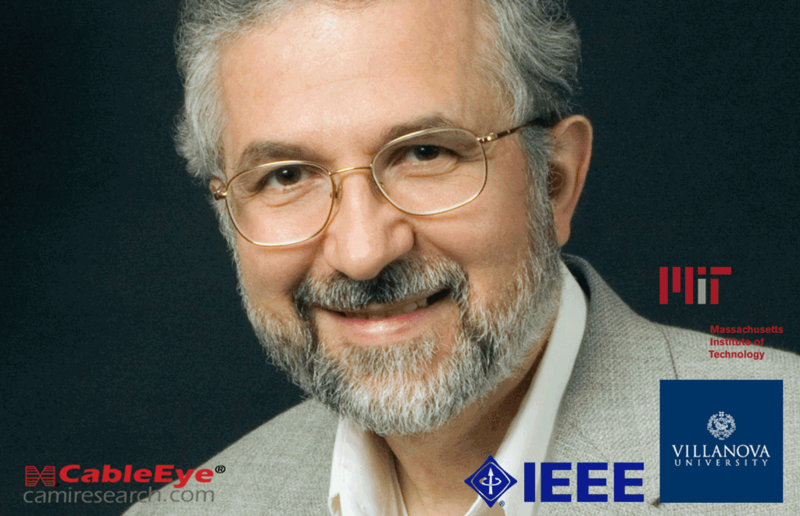 A lecturer at the MIT Lowell Institute School for twenty years, and author/presenter of a microprocessors multimedia course for the MIT Center for Advanced Engineering Study, he has been awarded two patents, an IEEE teaching award, a Villanova University technical achievement award, developed the CableEye PC-based cable & harness test system, and is a senior member of the IEEE. 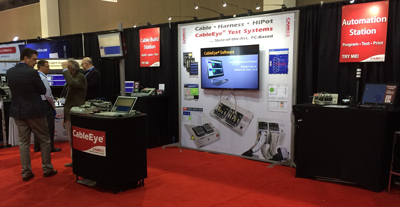 "Improving Reliability of Continuity & HiPot Tests"
CAMI Research will hold this invaluable professional development training session at a special show rate, the afternoon of Tuesday, May 7th at the Wisconsin Center (same location as the WPT EXPO). Space is limited, so please book early. If you're looking for the "Beyond Continuity & HiPot Measurements" complimentary seminar, please scroll up to the previous section. You are welcome to register for both. A Certificate of Attendance will be provided to everyone who completes the course. Each attending trainee will be eligible to participate in a drawing to win $500 in CableEye accessories. See below for details. list any topics that you would especially like to be covered. The session is being offered at a special Early-Bird Registration 50% discount off the regular $300 per person fee for all reservations secured on or before March 31 i.e. for full payment of $150. A special discount of 25% applies to those secured in April, and 15% to those secured in May up to and including May 3rd. Full payment is required to secure your reservation. Please call within 48 hours of submitting your form, or by the discount deadline (whichever is soonest) to provide payment. We invite you to Pre-register before April 17, for a complimentary Expo admission - Wednesday, May 8 through Thursday, May 9. The most practical, user friendly machine that I have ever used. I have used your units for several years, that is, when I worked for electronics manufacturing companies in the past. You have an outstanding product, and I say that, because I've seen my share of testing units in the 36 years that I've been in this business, and yours is the most practical, user friendly machine that I have ever used. 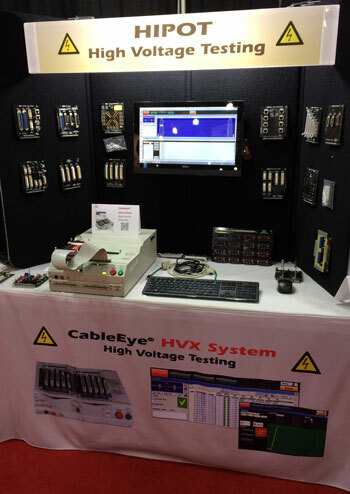 Attend our complimentary Professional Development Seminar, "Making the most of your Cable & Harness Tester", and leave your business card at the end. Attend our Professional Development Advanced Training Workshop "Improving Reliability of Continuity & HiPot Tests", and leave your business card at the end. 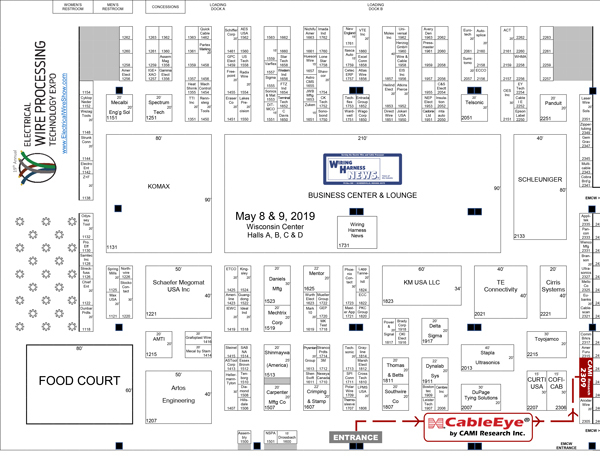 Meet with a CableEye respresentative at our booth (#2309) and leave your business card. Prize value $500 to be applied towards CableEye accessories of your choice with purchase of any new CableEye system. Prize expires Aug 1, 2019. Winning cards for each category will be drawn the week of May 13th. Winners will be notified within seven days. For diagnostic and Pass/Fail Testing - Find, display, log, & document: continuity (opens, shorts, miswires, intermittent connections).